An authentic taste of Malaysia ready in 1½ hours. In a frying pan, toast the desiccated coconut over a medium heat until golden. Pound to a paste with a pestle and mortar. Set aside. For the curry paste, put the ingredients in a processor; whiz until well combined. Fry the curry paste in a large wok for 30 seconds, then add the beef. 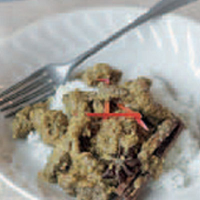 Cook for 5 minutes; add the coconut milk, spices and galangal. Season; simmer uncovered for 45 minutes, stirring regularly. Stir in the coconut paste; simmer gently, uncovered, for 45 minutes more, until the meat is tender and the sauce reduced. Stir it regularly to prevent it sticking. Serve with jasmine rice.